A new “study guide” for Letter VII on The Chariot has just been posted. While reading this summary is obviously no substitute for reading the original, it should offer a good review for those already familiar the text and may help to focus the new student’s attention on the core issue(s) being discussed. 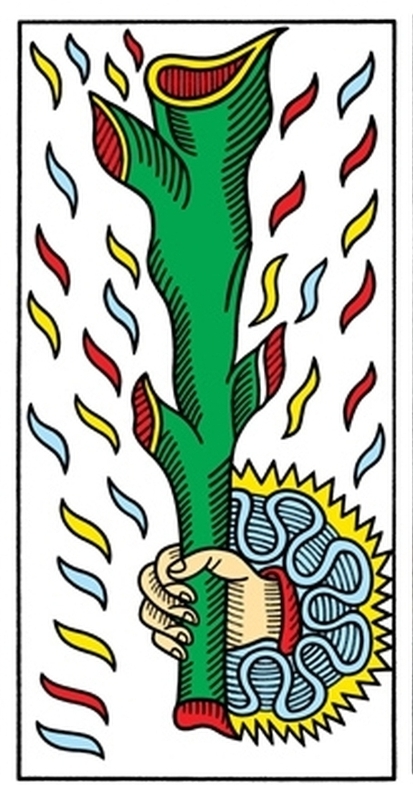 “Concerning the four “suits”—pentacles, swords, cups and wands —they correspond exactly to the structure of the sacred name YHVH and, consequently, to the four elements. 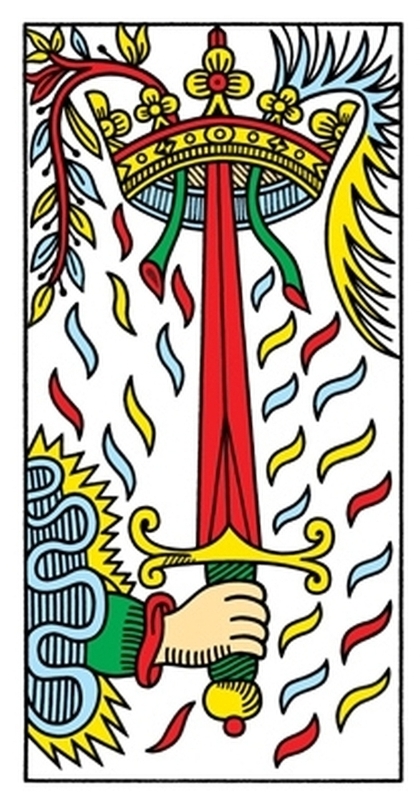 Wands represent the emanating principle, the YOD of the divine name; cups represent the conceiving principle, the first HE of the divine name; swords represent the formative principle,the VAU of the divine name; and pentacles symbolise the principle of form, the second HE of the divine name” (Letter XXII, “The World”, page 654; cf. “Figure 1 below). It is also worth noting that this is a work in progress which has been kept intentionally brief (and very dense) for ease of printing in these few, short pages. Additional clarification and elaboration is definitely in order. In the meantime, suffice it to say that the activity of Spirit cannot be grasped conceptually and cannot be used as a means to some merely personal/egoic end. It is nevertheless the case that the realization of Spirit does indeed constitute the true meaning and purpose of our lives and that such realization does have a practical impact on the apparent world. Moreover, we become more attuned to Spirit, 1) as we learn to distinguish between “awareness”, as such, and the incessant “mental chatter” which tends to accompany most of our perceptions (i.e. the habitual, usually unconscious “self-talk” which continuously expresses and reinforces our personal fears, desires, judgments); 2) as we begin to practice breath awareness and inner-body awareness as an aid to meditation; and 3) as we begin to anchor lives in “aware presence” or “alert stillness” — the pristine, lucid Way of Truth and Life which leaves unnecessary mental commentary and distracted, ineffective action beneath itself. Honest and sustained self-observation is essential to this work—discursive thought or dialectic is merely preparatory (see the discussion of “concentration without effort” in Letter I of Meditations on the Tarot, page 8). Spirit is reflected in and through the medium of the material world (including our apparent bodies and our material circumstances and resources). The Heart is our Transcending Aspect — the organ through which we become attuned to and are able to contemplate Spirit – i.e. our authentic life — and share it with the world at large. As our hearts open (in contemplation) we naturally turn away from a life of self-indulgent consumerism and towards our true vocation (whether that appears to be the life of a hermit or a healer; that of a poet, artist, or craftsman; or even that of a scientist, a priest, or a politician). Mind (psyche) / Ego / Analysis / Calculation / Instrumental Reasoning / Conceptual Frameworks (including the “ideas”, “beliefs” and “worldviews” that constitutes us as “separate selves”). Mind can be a hindrance or a help– an adversary or an ally –in our efforts to realize Spirit. On the one hand, “mind” is that aspect of ourselves that must be Transcended – that is, we must transcend the mind-made sense of self (i.e. the “arbitrary personality” or “separate individual”) which seems to obstruct the intuition of our unity with or connection to God, Nature, or Humanity as a whole. On the other hand, the practical operations of our mind begins to function better than ever once we realize that we are not what we think–once our egoic mind surrenders to the life of the Spirit . . . (the egoic/analytic mind makes “a wonderful servant, but a terrible master”, as is sometimes said). Transcending the ego does not mean fleeing our material existence–rather, from this point forward, we begin to relate properly to the material world for the very first time. For the “separate self”— i.e. the egocentric “consumer” mentality —the material world is understood primarily in terms of desire (a kind of self-indulgent “playground” for our appetites and inclinations as we continue to play the wheel of fortune). But for Spirit [and for the person/mind/psyche that is surrendered to Spirit] matter is a magical medium of artistic, poetic, religious, and political expression as we participate in “the respiration of eternity” — i.e. the One life, Divine. The Tarot images on the outside margins of this graphic are from the CBD Tarot de Marseille by Dr. Yoav Ben-Dov. The images on the inside are from the “Pocket Edition” of the Rider-Waite-Smith deck by US Games Systems, Inc.
To be fair, our TeenyTinyTarot © Trumps are especially designed with Valentin Tomberg’s “Christian Hermeticism” in mind. They’re great for personal study, meditation, and contemplation–and they are very inexpensive! But for those who are looking for a complete set of full-sized cards, the CBD Tarot de Marseille by Dr. Yoav Ben-Dov are a really good buy! 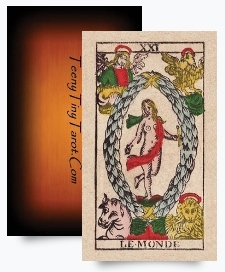 This premium Tarot deck is not only larger (2.5″ x 4.75″), it is also more colorful– more graphically and technically precise –top of the line in every respect! Perhaps you have heard our conventional existence in time and space referred to as the horizontal dimension (or plane) — in contrast to the vertical dimension which is accessible to us if and only if our hearts are open to it. This distinction is key to understanding the universal symbolism of “The Lover” who is pulled in two directions (reminiscent of the myth of the soul in Plato’s Phaedrus). Those who choose the route of separation (seeking to secure their personal power, pleasure, and prestige on the horizontal plane) encounter mixed success, at best, and then face death and destruction; while those who “die before they die”— those who become attuned to deeper/higher levels of reality — realize their eternal life NOW (i.e. the vertical dimension). NOTE: The PDF file is designed to be printed as a booklet (i.e. to be printed on both sides, folded, and stapled in the middle). My introduction to the Tarot came about quite unexpectedly through Meditations on the Tarot: A Journey Into Christian Hermeticism (hereafter “MOTT“–reputed to be among “100 best spiritual books” of the 20th century). Prior to reading MOTT, my evaluation of the Tarot was little different to that of most of my friends and colleagues in academia–or, for that matter, to my friends and family in the Bible belt. Indeed, my typical reaction to any mention of the Tarot would generally be comprised of about 2 parts of ridicule and 1 part of fear–with little or no energy left for open, honest engagement (much less meditation). “The Hermit is neither deep in meditation or study nor is he engaged in work or action. He is walking. This means to say that he manifests a third state beyond that of contemplation and action. . . . the term of synthesis, namely that of heart. For it is the heart where contemplation and action are united, where knowledge becomes will and where will becomes knowledge. The heart does not need to forget all contemplation in order to act, and does not need to suppress all action in order to contemplate. It is the heart which is simultaneously active and contemplative, untiringly and unceasingly. It walks. It walks day and night, and we listen day and night to the steps of its incessant walking. This is why, if we want to represent a man who lives the law of the heart, who is centred in the heart and is a visible expression of the heart — the “wise and good father”, or the Hermit — we present him as walking, steadily and without haste” (226). (“Meditations on the Tarot”, Letter IX, “The Hermit”). Do you believe in my promise ? Why are you waiting to follow Me ? Do you not feel that I am calling you ? Is none other than yourself. – But then, I am two ? No, my child, you are one. Who is the Christ in you. This work was originally written in French. A German translation with an introduction by Hans Urs von Balthasar appeared in 1972. A second revised German translation was published by Herder, Basel in 1983. The first French edition was published in 1980 and revised edition in 1984, both by Aubier Montaigne, Paris. The author wished the book to be published anonymously and posthumously. This may be regarded as one of the great spiritual classics of this century. In the hands of this author of immense erudition and deep contemplation, the Tarot cards of ancient Egypt reveal their universal archetypal symbolic nature and become a school of objective insight. The meditations are, in the truest sense, a school of lectio divina requiring an activity more profound than that of study and intellectual explanation. The author gathers us into his own spiritual journey to the authentic Source of all true knowledge and compassion. This book in my view is the greatest contribution to date toward the rediscovery and renewal of the Christian contemplative tradition of the Fathers of the Church and the high Middle Ages. With its firm grasp of tradition, its balance, wisdom, profundity, openness to truth, and comprehensive approach to reality, it deserves to be the basis of a course in spirituality in every Christian institution of higher learning and what would be even better, the point of departure and unifying vision of the whole curriculum. * Note: This review first appeared many years ago and has since been mirrored on a number of websites. Fr. Thomas Keating, OCSO, has written many books on contemplative prayer, especially Centering Prayer, which he is credited with popularizing in the United States. Among these are Open Mind, Open Heart, The Mystery of Christ, and Fruits and Gifts of the Spirit. He lives at St. Benedict’s Monastery in Snowmass, Colorado, and serves as an advisor to the Board of Directors of MID. Why in God’s name would a Christian want to meditate on the Tarot–and what the devil is an arcanum, anyway? arcana (n.) “hidden things, mysteries,” 1590s, a direct adoption of the Latin plural of arcanum “a secret, a mystery,” from neuter of adjective arcanus “secret, hidden, private, concealed” (see arcane). But superficially, the Major Arcana of the Tarot may be little more than a formal designation serving to distinguish the 22 Tarot Trumps from the other 56 minor arcana or suit cards. Indeed, a rough analogy can be drawn between the major and minor arcana of the Tarot, on the one hand, and the jokers and the other 52 cards in a standard poker deck, on the other. In fact, the joker often resembles the Tarot Fool (to some extent) and was originally created to serve as a trump in the game of Euchre. Less superficially, however, the designation of Major Arcana indicates the wide variety of deeper meanings that began to be attributed to these cards by the magicians and occultists of the 18th and 19th century (if not before). 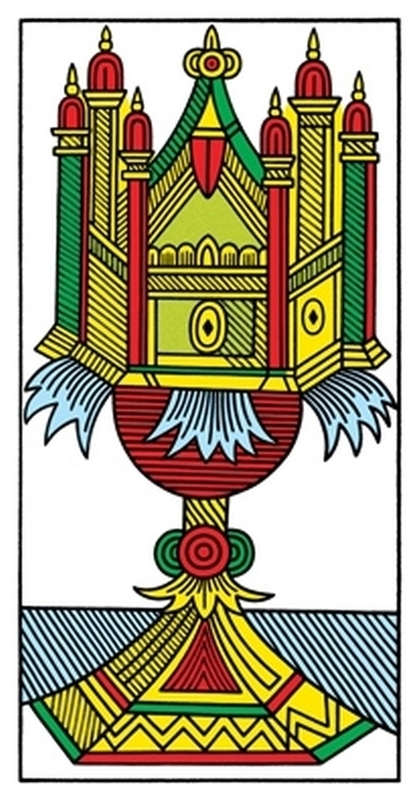 The actual phrase, Major Arcana, seems to have originated with Jean-Baptiste Pitois. 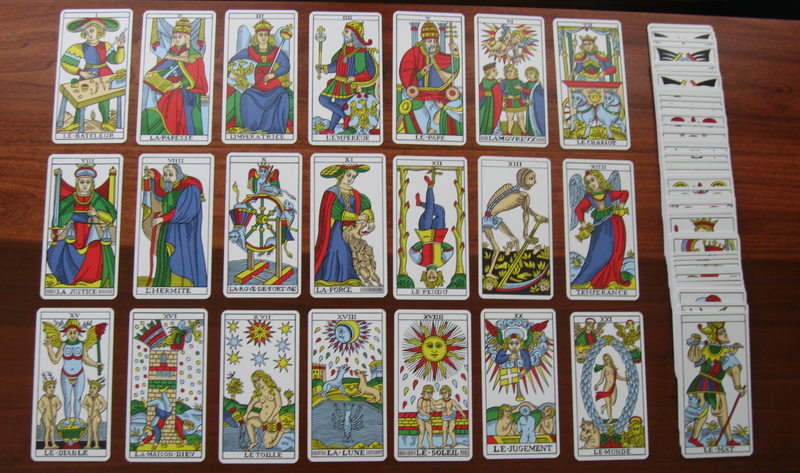 The Major Arcana of the Tarot are authentic symbols. They conceal and reveal their sense at one and the same time according to the depth of meditation. That which they reveal are not secrets, i.e. things hidden by human will, but are arcana, which is something quite different. An arcanum is that which it is necessary to “know” in order to be fruitful in a given domain of spiritual life. It is that which must be actively present in our consciousness —or even in our subconscious —in order to render us capable of making discoveries, engendering new ideas, conceiving of new artistic subjects. In a word, it makes us fertile in our creative pursuits, in whatever domain of spiritual life. An arcanum is a “ferment” or an “enzyme” whose presence stimulates the spiritual and the psychic life of man. And it is symbols which are the bearers of these “ferments” or “enzymes” and which communicate them —if the mentality and morality of the recipient is ready…” (Letter I, page 4). By way of the Major Arcana the author seeks to lead meditatively into the deeper, all-embracing wisdom of the Catholic Mystery. . . . 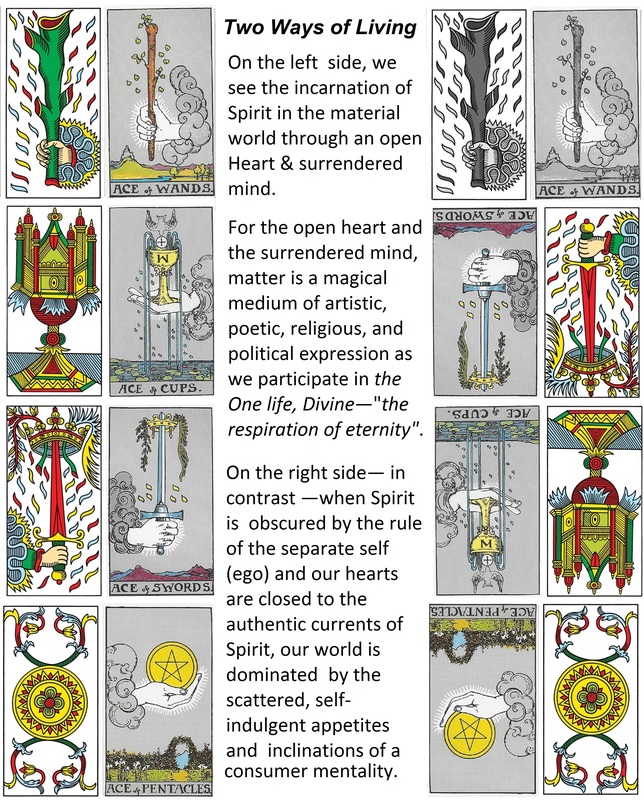 It is remarkable that the Meditations take the ancient symbolic pictures of the Tarot cards as their point of departure. Naturally the author knows about the magical-divinatory application of these cards. However, although he does not feel inhibited about using the multi-meaning word “magic”, in the Meditations, he is not at all interested in the practice of “laying the cards” (cartomancy). For him it is only the symbols or their essential meaning which are important — individually or in their mutual reference to one another. . . This “magical” capacity has nothing to do with the human being’s despotic nature — the commonplace, magical will-to-power, which seeks by way of world forces to gain dominion in the realm of knowledge and in the sphere of destiny. Rather it is something very different. One can only call it the “magic of grace”, the magic of which issues forth from the very heart of the mysteries of the Catholic faith (Afterword 659,661,663). Let us keep these explanations in mind as we continue to immerse ourselves in the current of this living tradition. As you play each card, turn the face-down card that was in that position face up and play it in its proper position, and so-on, until all the cards are face up in their proper positions (esoterically speaking) as indicated above. If The World turns up before the last play of the game (as is usually the case), play it face down in the position of another face-down card of your choosing and continue the game as before, until the last card is played in place of The World (wherever it happens to have finally ended up). 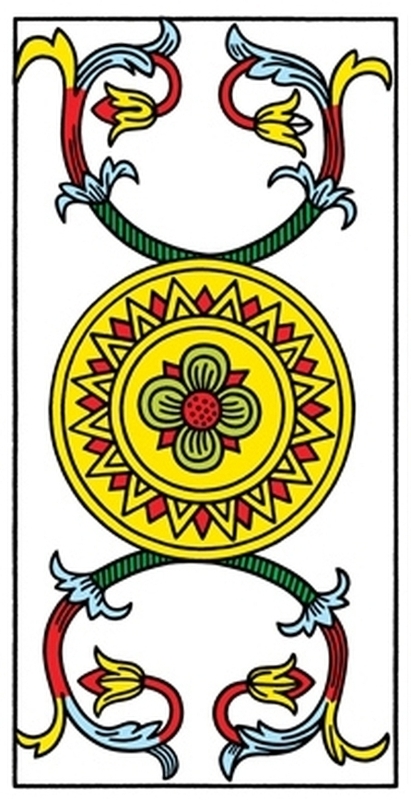 When the last numbered card is played and only The World remains, then (symbolically speaking) you may consciously enter into life— the eternal, joyful life of the kingdom –by playing the World to the right of the Fool — in position 22. “The world is a work of art. It is animated by creative joy. The wisdom that it reveals is joyous wisdom — that of creative-artistic elan . . . . Happy is he who seeks wisdom in the first place, for he will find that wisdom is joyous! Unhappy is the one who seeks the joy of joyous wisdom in the first place, for he will fall prey to illusions! Seek first the creative wisdom of the world — and the joy of creativity will be given to you in addition” (Letter 22, page 644).